Here, neighbors share small talk from wide balconies and open patios; groups of young ones gather for games of tag on sprawling green lawns. Nearby restaurants are full of foodies trying out the chef’s latest seasonal dish, while down the street, families sip hand-made sodas and milkshakes. Rosemary Beach is full of charm that draws visitors back again and again — which is just one reason why this beach neighborhood was named by CNN as one of America’s most romantic small towns. 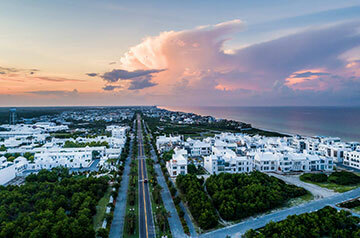 Come visit Rosemary Beach and let this destination sweep you off your feet.